For those of you that may encounter damaged devices due to Hurricane Harvey or Hurricane Irma, we can help you get your data back quickly and cost-effectively. 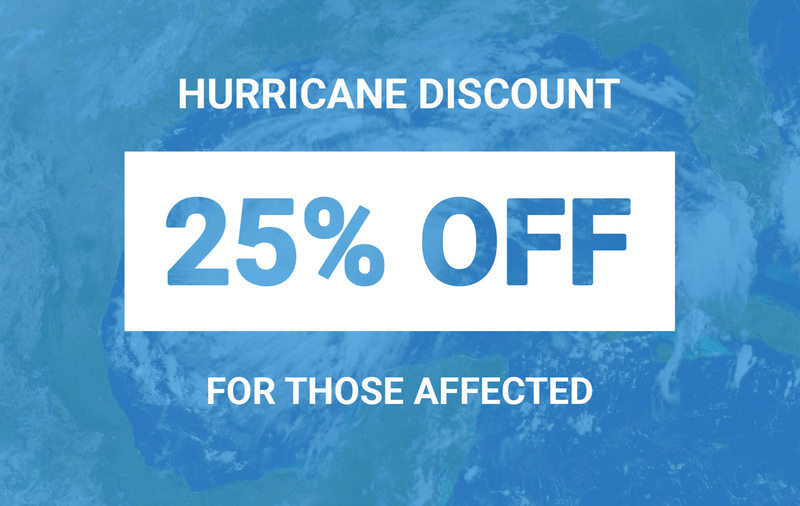 We are offering 25% discounts to any affected by the hurricane. Hurricanes can bring massive amounts of flooding and damage that can wreak havoc on computer systems and other devices. Salt water is extremely corrosive to electronic components. Flood waters from storm surges can be massively damaging to hard drive electronics and internal components. If you have a device that has been in salt water, please make sure you do not let it fully dry out if possible. If it is submerged, it is best to keep it wet in clean filtered water in transport to our lab. If it is already dry, do not turn it on, until it is looked at by a professional. Turning the power on can make recovery impossible without proper cleaning a diagnostics first. Flashback Data has been using the most sophisticated technology to retrieve lost data since 2004. If your computer, cell phone or other device experiences a failure and you need what’s on it, we can help. We cover Houston and the surrounding areas from the Sam Houston Statue to the Memorial Herman docks. We recover data from personal devices. As technology has become more portable, it has become more vulnerable to damage. The great thing about a lightweight laptop or super-fast tablet is that you can carry it with you. But when you do, things happen. When a device becomes badly damaged, customers fear everything is lost. In most cases we can use our advanced data recovery techniques to get it back. We work on all brands from all manufacturers, so if we work on your device, it will not void the warranty. We perform data recovery and other services for business. When companies upgrade their computers they often wonder what to do with the old ones. They can contain sensitive information and valuable past data. Flashback Data can archive your data or convert it to an alternative format. Our hard drive wiping service makes it safe to dispose of those old computers so you don’t have to store them or worry about information falling into the wrong hands. Flashback data can restore the data from your iPhone if something happens. We were the first company in the United States to use technology that pulls information directly from the phone’s NAND chip. If your phone was dropped in water or run over by a bulldozer we can still get your contacts and photos back. Here’s what to do if you need data recovery. Fill out our paperwork online. Either print a free UPS label to mail it in or drop it at our Northwest Houston location not far from the Race Park. We’ll give you tracking information to keep you updated while we work on your device. After we receive it, we’ll run a free diagnostic, then tell you what it will cost to retrieve your data. With your permission, we’ll recover your data and return it to you. If we can’t recover the data, you don’t pay. We’re the experts in data recovery. Let Flashback Data recover your data in our secure, state-of-the art facility. Contact us today to find out more.